Property 1: Quite, Secluded Vacation Spot. Property 2: Skillys Big Chip Lodge. Prime waterfront. Relax, fish, quality time, enjoy! Property 5: A True Northwood's Cabin Experience! Property 6: Super Private...Amazing Views...Quiet Solitude!! Property 12: Two bedroom cabin on Big Chetac lake in Birchwood. Great fishing and sunsets. Very Private Cabin on Upper Twin Lake...Large Lot...Great Views! Property 20: Very Private Cabin on Upper Twin Lake...Large Lot...Great Views! SPECIAL! Winter /Early Spring :Snowshoe, snowmobile, ice fish, snuggle by fire! Property 31: SPECIAL! Winter /Early Spring :Snowshoe, snowmobile, ice fish, snuggle by fire! Property 32: Lakefront Hayward Home w/ Fire Pit by Ski Trails! Property 35: Look no further - Sunset Retreat is your vacation spot! Beautiful Birchwood Lakeside Cabin Get-away; Awesome fishing & Amazing sunsets! Property 40: Beautiful Birchwood Lakeside Cabin Get-away; Awesome fishing & Amazing sunsets! Property 42: Cozy, private, woodsy retreat; clear water, sandy bottom, close to bike trails! Property 48: Spacious Northwoods Home - Perfect for Families - Great Fishing!! 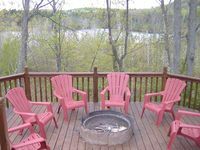 Make memories at this beautiful, comfortable northwoods retreat. Property 50: Make memories at this beautiful, comfortable northwoods retreat. Great place, with lots of entertainment. Great place, difficult if you have large trailers. Charming cabin on the water near town! Clean and comfortable.